There are few songs in the history of the human race that can elicit a universal response. When people hear the piano at the beginning of Journey’s “Don’t Stop Believing” for example, it’s impossible to not excitedly belt out, “Just a small town girl!” once Steve Perry’s angelic voice flutters into the speakers. I’ve never heard Rick Astley’s “Never Gonna Give You Up” and thought anything other than, “Welp, here we go again.” These are certain laws that we all must abide by as a species. One other song that evokes a similar hive mind reaction is the infectious Haddaway hit, “What Is Love?” The echo of his voice sends shock waves into the hearts and minds of anyone that hears the track, and if you’ve seen A Night at the Roxbury, then the iconic head bob will instinctively follow. It cannot and should not be prevented. This addictive dance is at the heart of the below video, recorded from inside the social virtual desktop sharing application, Bigscreen. In Bigscreen, you can resize and shape your monitor to be however you want. Throw it up on the wall for a massive theater experience, or sit at a virtual desk on the moon. 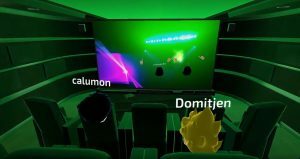 Bring your friends in with you and share your screens together and even access the entirety of your computer from within virtual reality, streamed to everyone else in the room. It’s a fascinating program that works surprising well for productivity, team meetings, and even virtual LAN parties. But as you can see in the video above, it can be used for so much more. The detailed avatars let people bring their hands and facial expressions into VR, which allows for immersive crowd-sourced moments like this. After seeing this dance party, we reached out to Hayden Lee for more information — he’s one of the developers working on Bigscreen and posted the video to a VR Facebook group. He explained that it was created using a glitch of some kind that allows a single user to control two avatars simultaneously inside the room, which results in the synchronized dancing you see above. Either way, it’s pretty hilarious and awesome. We know that Ubisoft is reportedly working on a Just Dance VR game and other social apps like Wonderland will surely encourage other such whimsical behavior, but this video just goes to show how badly we really, really want to play a dancing game in VR. It’s a whole lot harder to be embarrassed if you can’t see everyone else’s actual faces laughing at you, right?